This may seem really obvious to you, but I missed the opportunity for this simple stretch for many years. For 20 years I have always put a balance in relevé in arabesque on the end of the rond de jambe at the barre. 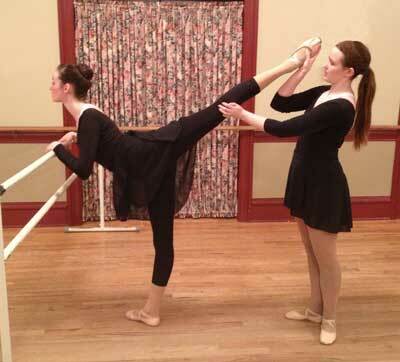 The students would be diagonal to the barre something like the picture below of attitude. I was forever telling them to adjust this shoulder and that hip. They had a very hard time feeling what I call “being square” with the shoulders and hips. This year I had the students face the barre for their arabesque at the end of their combination. In small classes I may stretch each student, or they quickly pair off. They grasp the barre equally with both hands and have elbows and shoulders symmetrical. They seem to understand about their shoulders being square to the barre. This does not help their arm presentation, but is a time to feel what arabesque should feel like in their trunk and legs. The student is encouraged to see how high their arabesque can be, and to feel the muscles it takes to lift the arabesque. I usually lift it as high as it can go comfortably and hold for a long moment. Then I lower a little and tell them to hold it as I let go. It has helped them so much to feel the arabesque and to stretch their flexibility. Everyone’s arabesque has improved dramatically. Even the person doing the stretching is learning. I show them how to support the knee and make sure it is straight. They are to be mindful of turnout throughout the leg and the foot. The helper can see how much more beautiful an arabesque is when the foot is properly pointed. I also like to include a back stretch and strengthener on the floor. Do a series of 4 or more pressing up with the arms and then laying down flat. Talk them through it slowly – first just lifting the shoulders and keeping the ribs to the floor – then press all the way. Going down first ribs and then shoulders. There are so many good Pilates exercises for ballet and for the back. This is a nice Pilates video to start with. Search in Youtube for “Pilates back arabesque” to find many more. Next have the students do several repetitions without their arms to gain strength in their backs. Gradually increase the number of repetitions as they get stronger. Use any combination of arms behind the back, arms in high 5th, or arms like arabesque. With time your students will get the feel of a curved arabesque instead of one with a forward penche type of look. 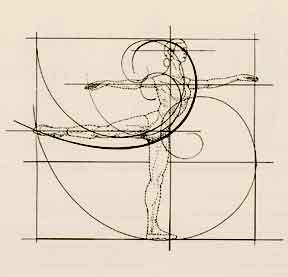 This illustration from “The Classic Ballet” describes the theory of arabesque with the shape of a “C”. It is always a challenge to train our dancers in a way that safely pushes their technique. I believe that if you have them doing good core strengthening exercises, you can confidently help them improve their arabesque. Your young dancers can perform their recital dances without help, and they can be evenly spaced while doing it.